Background Hamstring strain is a common injury in sprinters and jumpers, and therefore time to return to sport and secondary prevention become of particular concern. Objective To compare the effectiveness of two rehabilitation protocols after acute hamstring injury in Swedish elite sprinters and jumpers by evaluating time needed to return to full participation in the training process. Methods Fifty-six Swedish elite sprinters and jumpers with acute hamstring injury, verified by MRI, were randomly assigned to one of two rehabilitation protocols. Twenty-eight athletes were assigned to a protocol emphasising lengthening exercises, L-protocol, and 28 athletes to a protocol consisting of conventional exercises, C-protocol. The outcome measure was the number of days to return to full training. Re-injuries were registered during a period of 12 months after return. Results Time to return was significantly shorter for the athletes in the L-protocol, mean 49 days (1SD±26, range 18–107 days), compared with the C-protocol, mean 86 days (1SD±34, range 26–140 days). Irrespective of protocol, hamstring injuries where the proximal free tendon was involved took a significantly longer time to return than injuries that did not involve the free tendon, L-protocol: mean 73 vs 31 days and C-protocol: mean 116 vs 63 days, respectively. Two reinjuries were registered, both in the C-protocol. Conclusions A rehabilitation protocol emphasising lengthening type of exercises is more effective than a protocol containing conventional exercises in promoting time to return in Swedish elite sprinters and jumpers. The main objective of this study on Swedish elite sprinters and jumpers was to compare the effectiveness of two rehabilitation protocols for acute hamstring injuries with varying emphasis on muscle-tendon lengthening by evaluating time needed to return to full participation in the training process. Other aims were to study possible associations between injury type, location, size, palpation pain and time to return. Swedish male and female elite sprinters and jumpers were enrolled using our extensive contacts with medical teams and coaches working with elite track and field athletes in Sweden. These athletes were juniors (between 15 and 19 years) and seniors (20 years and older) ranked among the top 20 in each discipline indoors and/or outdoors. Also, the Swedish Athletic Association took part by informing all major track and field clubs in Sweden about the study. The total recruitment time was 38 months, January 2009–February 2012. Forty-six sprinters and 10 jumpers (of whom 8 were horizontal jumpers) were included, all with clinical signs of acute hamstring injury, as confirmed by MRI. A randomisation process was used to assign athletes to either of the two protocols, the L-protocol or the C-protocol, respectively. Athletes were stratified into subgroups according to gender, injury type (ie, sprinting-type or stretching-type injury) and proximal free tendon involvement or not (see below). The first athlete in each stratified subgroup was randomised to either the L-protocol or C-protocol using a dice. Subsequent athletes in each subgroup were then alternated between protocols. The allocation of each athlete in a subgroup was therefore dependent on the randomised allocation of the first athlete in that subgroup. In addition, eight sprinters and jumpers with clinical signs of acute hamstring injury, but where the MRI showed no sign of injury, were followed in parallel. These MRI-negative athletes were all assigned to the L-protocol. The use of non-steroidal anti-inflammatory drugs (NSAIDs) and/or other pain reducing medicine during the rehabilitation period was not allowed. All athletes gave their informed consent prior to participation. Approval of the study was granted by the Regional Ethics Committee (Dnr: 2008/1320-31/2). There were no dropouts in the study. To be included, the athlete had to have sustained acute sudden pain in the posterior thigh that immediately forced the athlete to stop the activity, training or competing. The initial clinical examination had to reveal localised pain when palpating the hamstring muscles, localised pain when performing a passive straight leg raise test, and increased pain when adding an isometric hamstring contraction during that test.8 Exclusion criteria included verified or suspected earlier hamstring injury in the same leg during the past 6 months, extrinsic trauma to the posterior thigh, ongoing or chronic low back problems and pregnancy. All athletes were examined within 2 days after the injury. The clinical examination included manual assessment of flexibility and strength of the injured and uninjured leg. The uninjured leg was always tested before the injured leg, and flexibility before strength. Flexibility was measured with a passive straight leg raise test (until the athlete reported pain and/or discomfort) and a standard flexometer.8 The isometric strength test was performed with the athlete in a prone position with resistance applied at the heel at 15° and 45° of knee flexion. The strength was tested manually by performing a combined knee flexion and hip extension due to the bi-articular nature of the hamstring muscles. Hamstring strength was also tested in a lengthened state in a supine position with the knee positioned at 15° of flexion while resistance was applied to the heel. The foot was maintained in plantar flexion in order to limit the activation of the gastrocnemius muscle. A bilateral comparison was performed for each measurement. The point of peak palpation pain was recorded and the distance between that point and the ischial tuberosity was measured.8 The same test-leader (CMA) performed this clinical examination weekly until there were no signs of injury remaining. The decision by the test-leader (CMA) that there were no signs of injury remaining had to be confirmed by an independent colleague by performing the same clinical examination. When the clinical examination at the end of the rehabilitation showed no signs of injury remaining, the Askling H-test was performed.22 A simplified version of the H-test, without an electrogoniometer but with a knee brace to keep the leg in extension and straps stabilising the upper body and the contralateral leg, was performed. The instruction to the athlete was to perform a straight leg raise as fast as possible to the highest point without taking any risk of injury (three trials per leg, uninjured leg tested first; no warm-up). If the athlete experienced any insecurity during this voluntary straight leg raising (on a Visual Analogue Scale, from 0 to 10), he/she was not allowed to go back to full training. Instead, the rehabilitation period was extended and the H-test repeated with an interval of 3–5 days until insecurity was eliminated. The time from the date of injury to the date of rehabilitation protocol initiation was 5 days for both protocols. Overall, exercises were chosen that could be performed in any place and without the use of advanced equipment. The exercises of the L-protocol specifically aimed at loading the hamstrings during extensive lengthening, mainly during eccentric muscle actions. In contrast, the C-protocol consisted of conventional exercises for the hamstrings with less emphasis on lengthening. Each rehabilitation protocol consisted of three different exercises, where exercise 1 was aimed mainly at increasing flexibility, exercise 2 was a combined exercise for strength and trunk/pelvis stabilisation and exercise 3 was more of a specific strength training exercise.13 All exercises were performed in the sagittal plane. The intensity and volume of training were made as equal as possible between the two protocols. The training sessions were supervised, at least once every week, during the whole rehabilitation period, and the speed and load were increased over time. No pain provocation was allowed at any time when performing the exercises. All exercises included in the two rehabilitation protocols are explained in figures 1⇓⇓⇓⇓–6. Video demonstrations of all six exercises (L-protocol and C-protocol) showing how the progression can be performed are included as supplemental files. L-1 ‘The Extender’: the player should hold and stabilise the thigh of the injured leg with the hip flexed approximately 90° and then perform slow knee extensions to a point just before pain is felt. Twice every day, 3 sets with 12 repetitions (see online supplementry video 1). L-2 ‘The Diver’: the exercise should be performed as a simulated dive, that is, as a hip flexion (from an upright trunk position) of the injured, standing leg and simultaneous stretching of the arms forward and attempting maximal hip extension of the lifted leg while keeping the pelvis horizontal; angles at the knee should be maintained at 10–20° in the standing leg and at 90° in the lifted leg. Owing to its complexity, this exercise should be performed very slowly in the beginning. Once every other day, three sets with six repetitions (see online supplementry video 2). L-3 ‘The Glider’: the exercise is started from a position with upright trunk, one hand holding on to a support and legs slightly split. All the body weight should be on the heel of the injured (here left) leg with approximately 10–20° flexion in the knee. The motion is started by gliding backwards on the other leg (note the low friction sock) and stopped before pain is reached. The movement back to the starting position should be performed by the help of both arms, not using the injured leg. Progression is achieved by increasing the gliding distance and performing the exercise faster. Once every third day, three sets with four repetitions (see online supplementry video 3). C-1 Stretching—contract/relax. The heel of the injured leg is placed on a stable support surface in a high position (close to maximum) with the knee in approximately 10° flexion. The heel is pressed down for 10 s and then, after relaxation for 10 s, a new position is assumed by flexing the upper body slowly forwards for 20 s. Twice a day, three sets with four repetitions (see online supplementry video 4). C-2 Cable-pendulum: A stationary cable-machine or expander is used. With the uninjured leg as the standing leg, forward–backward hip motions are performed with the injured leg with the knee in approximately 20–30° flexion. This exercise involves the whole body and should be performed slowly in the beginning of the rehabilitation period. Once every other day, three sets with six repetitions (see online supplementry video 5). C-3 Pelvic lift: This exercise is started in a supine position with the body weight on both heels, and then the pelvis is lifted up and down slowly. Start with the knee in 90° of flexion. The load is increased by putting more of the body weight on the injured leg and by having a greater extension in the knee. Ultimately, only the slightly bent injured leg is carrying the load. Every third day, three sets with eight repetitions (see online supplementry video 6). A general rehabilitation programme with a subject-specific progression was followed by all athletes in both specific protocols. The general programme was implemented by the test-leader (CMA) week by week and supervised by the PT responsible for the athlete in the track and field club during the entire rehabilitation period. No pain and/or discomfort was allowed from the injured posterior thigh during the rehabilitation process. Acutely, the athlete should use crutches if pain was provoked by walking. The general programme was performed three times a week and started with stationary cycling 10 min, 10×20 s fast foot stepping in place, 10×jogging 40 m with short strides, 10×10 m forward/backward accelerations. When the above part of the general programme could be performed without pain and/or discomfort, a progressive running programme was started. This was composed of high-speed running drills 6×20, 4×40 and 2×60 m, performed three times a week. In addition to the specific protocol and the general programme, all athletes were asked to conduct as much as possible of their standard training programme without experiencing any pain and/or discomfort. This training was supervised by their regular track and field coaches. The main outcome was time to return, that is, time from injury to full participation in the training process. Also, occurrence of reinjuries was registered during a 12 month period after return. If a re-injury occurred, the medical team responsible was to immediately contact the study leader so that the same procedure as for the original injury could be repeated. The full 1-year follow-up period was completed by all athletes in the study. All statistical analyses were conducted with STATISTICA V.11.0 software (StatSoft Inc). The Shapiro-Wilk W tests showed that the data were not normally distributed. A Mann-Whitney U test was performed to investigate differences in age, height and mass as well as MRI and palpation measures. A χ2 test was applied to investigate differences in proportion of injury type and PT involvement as well as in gender. The Mann-Whitney U test was also used to assess differences in time to return between the protocols, between subgroups with respect to PT involvement (with Bonferroni correction applied), as well as between MRI-negative athletes and athletes with sprinting-type injury within the L-protocol. The Mann-Whitney U test (Cohen's d) for independent samples was applied and the χ2 test (p) was used as a measure of effect size. Spearman's rank order correlations were calculated to investigate associations between time to return and MRI and palpation parameters. The significance level was set at p≤0.05. Thirty (52%) of all the 56 MRI-verified injuries occurred during competition, 14 (50%) in the L-protocol and 16 (57%) in the C-protocol, respectively. Fifty-two (93%) of the 56 injuries were sprinting-type and 4 (7%) stretching-type injuries. In 44 of the 56 athletes (79%), the primary injury was located in the long head of biceps femoris (BFlh) and in 7 of those 44 (16%), there was a secondary injury, in all cases located in the semitendinosus (ST). In the remaining eight injuries of sprinting type, the primary injury was located in the ST. In the four athletes with a stretching-type injury, the injury location was in the semimembranosus. There were no significant differences between groups of athletes in the L-protocol and the C-protocol with respect to age, height, mass, gender, performance level, type of injury and involvement of the proximal free tendon (table 1). Neither were there any group differences in distance between the most proximal pole of the oedema and the ischial tuberosity, length of the oedema and distance between the point of peak palpation pain and the ischial tuberosity (table 1). Eight athletes (29%) in the L-protocol and 19 (68%) in the C-protocol experienced insecurity when performing the H-test and therefore needed to extend their rehabilitation period. On average, the time to return was prolonged by 8 days (1SD±3.0, range 3–14) in the L-protocol and by 10 days (1SD±3.5, range 4–20) in the C-protocol, respectively. 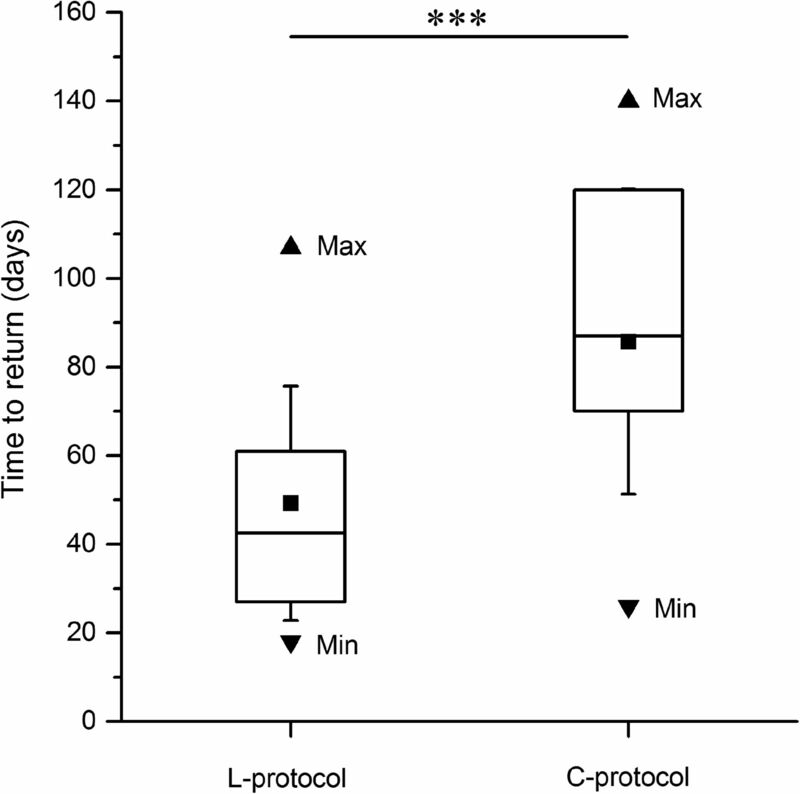 Time to return was significantly shorter in the L-protocol compared with the C-protocol (p<0.001, d=−1.21), mean 49 days (1SD±26, range 18–107 days) versus 86 days (1SD±34, range 26–140 days; figure 7). Time to return was also significantly shorter in the L-protocol than in the C-protocol for injuries not involving and involving the PT (p<0.01, d=−1.76 and p<0.01, d=−2.12, respectively; figure 8). Injuries not involving the PT showed a significantly shorter time to return than those involving the PT in the L-protocol and C-protocol (p<0.001, d=−2.65 and p<0.001, d=−2.41, respectively; figure 8). Time to return for the four stretching-type of injuries was, on average, 121 days (range 106–140 days). Correlation analysis showed that the shorter the distance to the ischial tuberosity from the most proximal pole of the injury measured by MRI or peak palpation pain, the longer was the time to return (table 2). 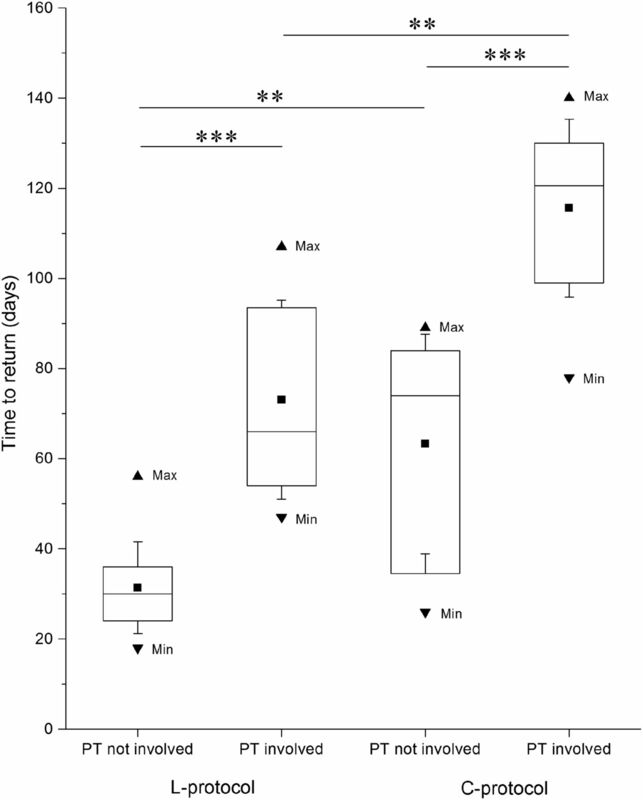 A longer length of the oedema was also correlated with a significantly longer time to return (table 2). Time to return, in days, in the L-protocol (n=28) and C-protocol (n=28). The boxes represent IQRs in the boxes, the horizontal lines represent median values and black squares represent mean values; whiskers=mean±1 SD. *** Denotes significant difference (p<0.001, Mann-Whitney U test). Time to return, in days, for athletes with injuries either involving or not involving the proximal free tendon (PT) in the L-protocol (n=12 and 16, respectively) and the C-protocol (n=12 and 16, respectively). The boxes represent IQRs; in the boxes, the horizontal lines represent median values and black squares represent mean values; whiskers = mean±1 SD. **p<0.01; ***p<0.001 denote significant differences (Mann-Whitney U test). There were two re-injuries registered during the 12-month follow-up period. These re-injuries occurred in the C-protocol 88 and 120 days after the initial injury, respectively. Both re-injuries were of sprinting-type and located in the BFlh. The times to return for the re-injuries were 34 and 42 days as compared with 56 and 88 days for the initial injuries. All of the eight injuries in the MRI-negative group were of sprinting-type. The characteristics of the MRI-negative group were similar to those of the corresponding group of 26 athletes with MRI-confirmed sprint injuries in the L-protocol (table 3), but had a significantly shorter time to return (p<0.001, d=−1.59), mean 15 days (1SD±3, range 11–19 days) versus 45 days (1SD±22, range 18–99 days; figure 9). 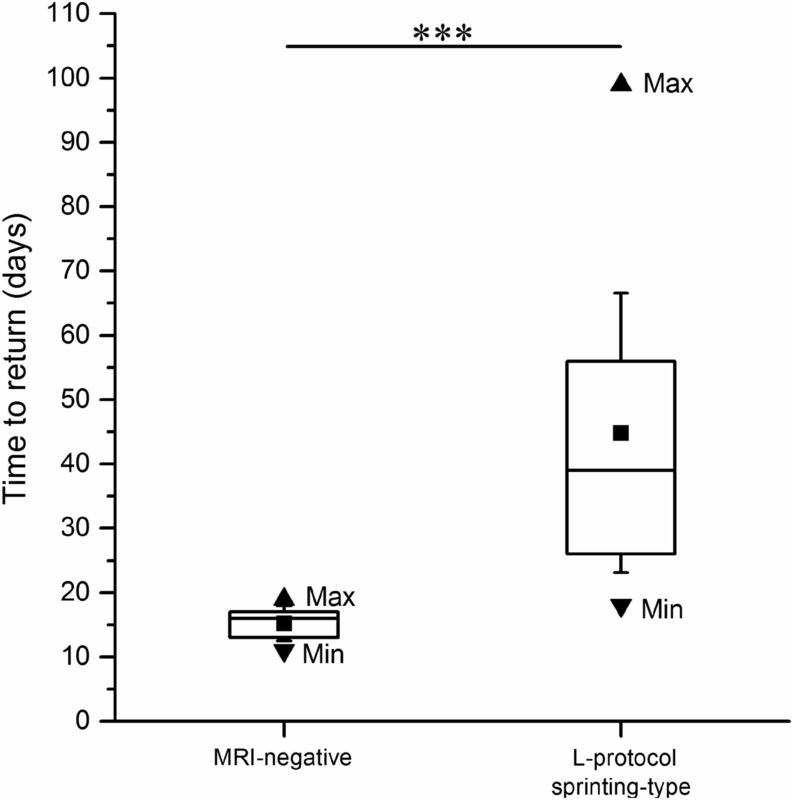 Time to return, in days, for MRI-negative athletes (n=8, all performing L-protocol) and for athletes with sprinting-type injuries within the L-protocol (n=26). The boxes represent IQRs; in the boxes, the horizontal lines represent median values and black squares represent mean values; whiskers=mean±1 SD. *** Denotes significant difference (p<0.001, Mann-Whitney U test). The choice of rehabilitation protocol after acute hamstring injury can have a considerable effect on time to return to full training in Swedish elite sprinters and jumpers. In this study, the average time to return was 37 days shorter, 49 vs 86 days (43%) with exercises emphasising loading of the hamstring muscles at lengths near the maximal hamstring length (L-protocol) as compared with conventional exercises (C-protocol). Hamstring length was probably similar in the flexibility exercises in both protocols. A similar sized superiority of the L-protocol was recently reported by Askling et al13 in a study on hamstring injuries in Swedish elite football players, using the same method as in the present study, the mean recovery times being 28 days (range 8–58 days) and 51 days (range 12–94 days) for the L-protocol and C-protocol, respectively. The exercises in the L-protocol and C-protocol were selected based on practical experience. This includes a number of exercises, joint excursions and speed. Progression was steered by the avoidance of pain. Considering the lack of objective data, we have chosen to describe the protocols in quite some detail for the readers/users to form their own opinions. It is our belief that the rather remarkable difference in outcome between the two protocols is mainly due to the more systematic attempts to put load on the hamstrings during maximal dynamic lengthening in the L-programme, involving movements at the hip and the knee. Otherwise, the two protocols were made as similar as possible in terms of early start after injury, thorough instruction and regular follow-up and progression in load/speed/excursion based on the avoidance of the pain criterion. It is proposed that neuromuscular inhibition of hamstring voluntary activation occurs following acute hamstring injury, and that this inhibition has a negative effect on hamstring recovery by limiting hamstring load during lengthening exercises.18 ,19 This limited exposure to eccentric stimuli at long hamstring muscle lengths could potentially lead to eccentric hamstring weakness and selective hamstring atrophy, possibly in combination with selective hypertrophy of the short head of biceps femoris,18 resulting in a shift in the torque–angle relationship.19 The L-protocol used in the present study was aimed to stress the injured hamstrings from day five after injury occurrence and during the entire rehabilitation process. One possible explanation of the positive result of the L-protocol could be that the type of exercises included in the protocol was beneficial to voluntary activation of the injured hamstrings compared with the C-protocol. Earlier investigations have demonstrated that the type of injury, involvement of the free muscle tendon, location of pain and injury in relation to the ischial tuberosity and the size (length) of the injury are important factors associated with the duration of the time to return.8–13 The current study showed that increased recovery time can be expected with peak palpation pain closer to the ischial tuberosity, MRI documented involvement of the free muscle tendon, oedema closer to the ischial tuberosity and longer overall oedema length. Time to return to sport (average 15 days) for the MRI-negative group was clearly the shortest. This is in accordance with earlier studies demonstrating that MRI-negative cases have better prognosis for recovery than those showing injury signs on MRI.13 ,14 There were too few stretching type of injuries (4 of 56) to allow a statistical comparison, but actual times to return for athletes with stretching mechanisms were all longer than the longest for the sprint injuries. Otherwise, the data confirmed earlier findings from sprinters, dancers and a group of athletes from different sports as well as from football players.8–13 A notable difference was that the injury length was smaller and its distance to tuber longer in the current athletes than in the football players despite a longer time to return.13 One factor that may explain the longer time to return to sport for sprinters and jumpers compared with football players is that in order to prevent re-injury elite sprinters and jumpers probably need 100% restored function, but an elite football player can possibly play again without 100% restored function. This indicates that such associations should preferably be made within the same category of sport. Finally, a couple of additional practical observations concerning the injury situation and training layout might be worth highlighting. Almost half, 26 of 56, of the injuries occurred during training sessions, about equally distributed between the two protocols: 14 (50%) in the L-protocol and 12 (43%) in the C-protocol, respectively. The athletes witnessed that a clear majority (20; 77%) of these injuries happened at the very end of a training session with high-speed drills, typically during the last of a total of 10 planned repetitions of 120 m sprints to maximal speed. Of the four stretching-type of injuries, all occurring during initial warm-up, two happened when the coach manually applied force to make the athlete reach a more extreme movement excursion in a unilateral straight leg raise. Following the initial clinical examination and the MRI investigation, the test-leader (CMA) randomised the athletes to the L-protocol or C-protocol, respectively. One of the authors (CMA) was responsible for supervising all athletes’ rehabilitation protocols once a week and also for performing the clinical examinations and the Askling H-test. This provided consistency for instructions, examinations and testing. However, it prevented blinding and increased the risk of bias. To decrease bias, an independent, blinded test leader had to verify absence of clinical injury signs before the Askling H-test. Furthermore, the performance in this test was judged by the athlete in terms of absence of insecurity. Finally, it needs to be pointed out that the cohort consisted of elite athletes eager to perform well and return to sport as soon as possible. A rehabilitation protocol consisting of mainly lengthening type of exercises is more effective than a conventional protocol in promoting return to full training in Swedish elite sprinters and jumpers after acute hamstring injury. On this basis, it is recommended that hamstring injury rehabilitation protocols should be preferentially based on strength and flexibility exercises that primarily involve high loads at long muscle-tendon lengths. Further studies are needed to verify the possible role of applying the Askling H-test to reduce the commonly high rate of recurrence of hamstring injury. A rehabilitation protocol consisting of mainly lengthening type of exercises is more effective than a conventional protocol in promoting return to full training after acute hamstring injuries in Swedish elite sprinters and jumpers. Improve rehabilitation efficiency after acute hamstring injury by using protocols with lengthening exercises. Improve prognosis by using palpation and MRI to establish injury pain, location, tissues involved and size. The authors thank the Swedish Athletic Association and the medical staff and coaches in the Swedish elite track and field clubs, who sent athletes to be included in the study. The authors also thank Hans Larsson, Sabbatsberg Sjukhus, Toni Arndt, The Swedish School of Sport and Health Sciences and Ulf Gustafsson, FeelGood for their skilful contributions to this research. The Swedish Centre for Sport Research is gratefully acknowledged for financial support.
. Sports injuries surveillance during 2007 IAAF World Athletics Championships. Clin J Sports Med 2009;19:26–32.
. Injuries and illness during the 2011 Paris European Athletics Indoor Championship. Scand J Med Sci Sports 2013;23:213–18.
. Acute first-time hamstring strains during high-speed running. A longitudinal study including clinical and magnetic resonance imaging findings. Am J Sports Med 2007;35:197–206.
. Acute first-time hamstring strains during slow-speed stretching. Clinical, magnetic resonance imaging, and recovery characteristics. 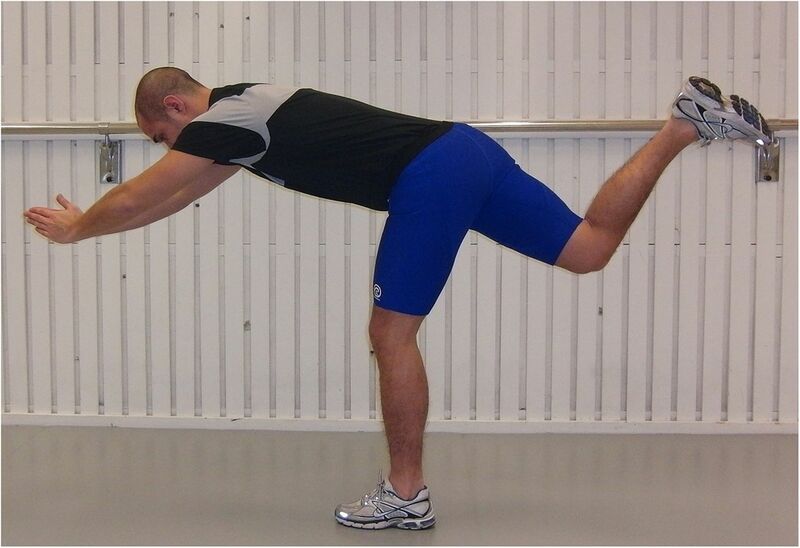 Am J Sports Med 2007;35:1716–24.
. Proximal hamstring strains of stretching type in different sports. Injury situations, clinical and magnetic resonance characteristics, and return to sport. Am J Sports Med 2008a;36:1799–804.
. Hamstring muscle strain in sprinters. New Stud Athletics 2008b;23:67–79.
. Acute hamstring injuries in Swedish elite football: a prospective randomized clinical trial comparing two rehabilitation protocols. Br J Sports 2013;47:953–9.
. Epidemiology of muscle injuries in professional football. Am J Sports Med 2011;13:1226–32.
. Re-injury after acute posterior thigh muscle injuries in elite track and field athletes. Am J Sports Med 2011;39:304–10.
. Hamstring strain injuries. Factors that lead to injury and re-injury. Sports Med 2012;42:209–26.
. Knee flexor strength and bicep femoris electromyographical activity is lower in previously strained hamstrings. J Electromyogr Kinesiol 2013;23:696–703.
. A compariason of 2 rehabilitation programs in the treatment of acute hamstring strains. J Orthop and Sports Phys Ther 2004;34:116–25. Contributors CMA, MT and AT designed the study. CMA, MT, OT and AT monitored the data collection, analysed the data and drafted and revised the paper. Funding This study was supported by grants from the Swedish Centre for Sport Research, grant number FO2012-0045.